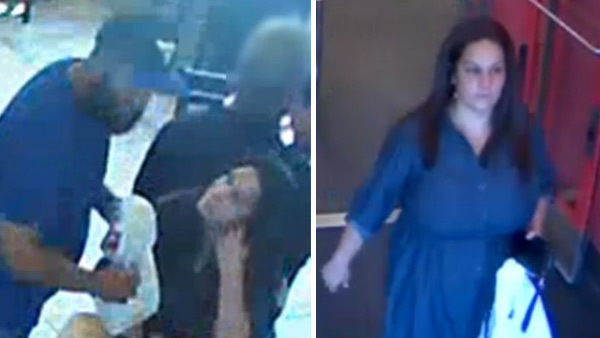 PENNSYLVANIA -- Police have arrested a man and woman accused of swiping a woman's credit card from a Chick-Fil-A restaurant in Bensalem, Pennsylvania. The pair have been identified as 48-year-old Michael Grantham of New Jersey, and 41-year-old Mary Ramirez of Philadelphia. It happened Wednesday. Surveillance video shows Grantham and Ramirez sit down at a table. Ramirez kept a lookout while Grantham positioned his chair so he was right near a mother and her children. Police say he stole the victim's wallet, then they went to a nearby Target and used her credit card. They tried to use the card again at a different Target, but the card was declined. Police say tips helped police identify the pair. Grantham is in Camden County Prison on $75,000 bail awaiting extradition, and Ramirez is in Bucks County Prison in lieu of $75,000 bail, 10 percent.